Definition at line 64 of file Messaging.c. Definition at line 729 of file apphelp.c. Referenced by BaseDumpAppcompatCache(), BaseFlushAppcompatCache(), and CallApphelp(). Definition at line 420 of file psfuncs.h. Referenced by __declspec(), __wine_pop_frame(), __wine_push_frame(), _NtCurrentTeb(), AbortDoc(), actctx_init(), AVrfInitializeVerifier(), AvrfpResolveThunks(), BaseCreateStack(), BaseCreateThreadPoolThread(), BaseGetNamedObjectDirectory(), Basep8BitStringToStaticUnicodeString(), BasepComputeProcessPath(), BasepLoadLibraryAsDatafile(), BuildUserModeWindowStationName(), CallMsgFilterA(), CallMsgFilterW(), CallNamedPipeA(), CloseAllProcessHandles(), COM_CurrentInfo(), COM_TlsDestroy(), CompareStringA(), ConvertFiberToThread(), ConvertThreadToFiberEx(), CountHandlers(), CreatePipe(), CreateProcessInternalW(), CSR_API(), CsrApiHandleConnectionRequest(), CsrApiRequestThread(), CsrClientCallServer(), CsrConnectToUser(), CsrIdentifyAlertableThread(), CsrInitializeProcessStructure(), CsrValidateMessageBuffer(), DbgkMapViewOfSection(), DbgUiConnectToDbg(), DbgUiContinue(), DbgUiDebugActiveProcess(), DbgUiGetThreadDebugObject(), DbgUiSetThreadDebugObject(), DbgUiStopDebugging(), DbgUiWaitStateChange(), DeleteFiber(), DllMain(), doChild(), ElfChangeNotify(), EndDoc(), EngGetLastError(), EngSetLastError(), ExitThread(), extfmt_default_dbg_vlog(), ExtTextOutW(), FatalAppExitA(), FilenameA2W(), find_entry(), find_entry_language(), find_query_actctx(), FlsAlloc(), FlsGetValue(), FlsSetValue(), GdiAllocBatchCommand(), GdiDeleteBrushOrPen(), GdiDllInitialize(), GdiProcessSetup(), GdiQueryTable(), GdiSetLastError(), get_base_dir(), get_or_create_threaddata(), GetBinaryTypeA(), GetCurrentDirectoryA(), GetCurrentProcessId(), GetCurrentThreadId(), GetLastError(), GetModuleHandleA(), GetTeb(), GetTempFileNameW(), GetThreadLocale(), GetUserObjectSecurity(), GetW32ThreadInfo(), GetWindowThreadProcessId(), GuiConsoleInputThread(), hash_basename(), hGetPEBHandle(), InitThreadCallback(), IntAddSynthesizedFormats(), IntEndPage(), InternalAddAtom(), InternalFindAtom(), IntGetCurrentDC(), IntGetCurrentDcData(), IntGetCurrentDispatchTable(), IntGetCurrentICDPrivate(), IntGetCurrentRC(), IntMakeCurrent(), IntNotifyWinEvent(), IntSetCurrentDispatchTable(), IntSetCurrentICDPrivate(), IntSetThreadDesktop(), IsGUIThread(), IsThreadAFiber(), IsWinEventHookInstalled(), KiRaiseUserExceptionDispatcher(), KiSystemServiceHandler(), LCMapStringA(), ldr_notify_callback1(), ldr_notify_callback_dll_main(), ldr_notify_callback_fail(), LdrLoadDll(), LdrpAllocateTls(), LdrpFreeTls(), LdrpInit(), LdrpInitializeProcess(), LdrpInitializeThread(), LdrpInitSecurityCookie(), LdrpLoadImportModule(), LdrpMakeCookie(), LdrpMapDll(), LdrpRunInitializeRoutines(), LdrpUpdateLoadCount3(), LdrShutdownProcess(), LdrShutdownThread(), LdrUnlockLoaderLock(), load_gl_funcs(), Main(), MyGdiQueryTable(), NlsInit(), NtGdiFlushUserBatch(), NtUserSetWindowsHookAW(), OffsetViewportOrgEx(), OffsetWindowOrgEx(), ok_fls_(), PolyPatBlt(), PostMessageA(), PostMessageW(), PsConvertToGuiThread(), PspUserThreadStartup(), RemoveHandles(), rosfmt_default_dbg_vlog(), RtlAcquirePrivilege(), RtlAcquireResourceExclusive(), RtlAcquireResourceShared(), RtlActivateActivationContext(), RtlActivateActivationContextUnsafeFast(), RtlApplicationVerifierStop(), RtlConvertSharedToExclusive(), RtlCreateActivationContext(), RtlDeactivateActivationContext(), RtlDeactivateActivationContextUnsafeFast(), RtlEnterCriticalSection(), RtlExitUserThread(), RtlFindActivationContextSectionGuid(), RtlFindActivationContextSectionString(), RtlFreeThreadActivationContextStack(), RtlGetActiveActivationContext(), RtlGetCriticalSectionRecursionCount(), RtlGetFrame(), RtlGetLastNtStatus(), RtlGetLastWin32Error(), RtlGetThreadErrorMode(), RtlInitializeCriticalSectionAndSpinCount(), RtlIsActivationContextActive(), RtlIsCriticalSectionLockedByThread(), RtlIsThreadWithinLoaderCallout(), RtlLeaveCriticalSection(), RtlNtStatusToDosError(), RtlpCaptureStackLimits(), RtlpClearInDbgPrint(), RtlpDphProcessStartupInitialization(), RtlpFreeDebugInfo(), RtlPopFrame(), RtlpPageHeapCreate(), RtlpPageHeapDestroy(), RtlpSetInDbgPrint(), RtlPushFrame(), RtlpWaitForCriticalSection(), RtlQueryProcessDebugInformation(), RtlSetLastWin32Error(), RtlSetLastWin32ErrorAndNtStatusFromNtStatus(), RtlSetThreadErrorMode(), RtlTryEnterCriticalSection(), ScControlService(), ScServiceMainStubA(), ScServiceMainStubW(), service_main(), SetConsoleInputExeNameA(), SetGraphicsMode(), SetLastError(), SetMapperFlags(), SetPolyFillMode(), SetROP2(), SetTextCharacterExtra(), SetTextJustification(), SetThreadLocale(), SetThreadUILanguage(), SetUserObjectSecurity(), SetViewportExtEx(), SetWindowExtEx(), SetWindowOrgEx(), SetWindowsHookA(), SetWindowsHookW(), SockEnterApiFast(), START_TEST(), StartPage(), TerminateThread(), test_HashLinks(), test_import_resolution(), test_InMemoryOrderModuleList(), test_query_object(), test_RemoveDirectoryA(), test_RemoveDirectoryW(), test_RtlThreadErrorMode(), TestWindowProcess(), TlsAlloc(), TlsGetValue(), TlsSetValue(), UnhandledExceptionFilter(), UpdateColors(), UserDbgAssertThreadInfo(), UserSetLastError(), VdmDispatchBop(), VdmDispatchPageFault(), VdmpGetVdmTib(), Win32kThreadCallback(), wined3d_cs_create(), winefmt_default_dbg_vlog(), and WTSQuerySessionInformationW(). Definition at line 1133 of file process.c. Referenced by ExpWin32SessionCallout(), IntCreateDesktop(), IntDestroyMenuObject(), NtSetInformationObject(), NtUserSwitchDesktop(), ObpLookupObjectName(), and VideoPortUseDeviceInSession(). Definition at line 1183 of file process.c. Referenced by _Function_class_(), CheckWinstaAttributeAccess(), co_IntGraphicsCheck(), co_IntSetParent(), co_IntSetWindowLongPtr(), co_IntUserManualGuiCheck(), co_UserDestroyWindow(), DC_bAllocDcAttr(), DC_vFreeDcAttr(), DecrementCurrentProcessGdiHandleCount(), DesktopHeapAddressToUser(), DesktopHeapGetUserDelta(), GDI_CleanupForProcess(), GetBrushAttrPool(), GetControlColor(), GetFontFamilyInfoForSubstitutes(), GetW32ProcessInfo(), handle_internal_message(), IdlePing(), IdlePong(), IncrementCurrentProcessGdiHandleCount(), IntAllowSetForegroundWindow(), IntGdiAddFontMemResource(), IntGdiCleanupPrivateFontsForProcess(), IntGdiLoadFontsFromMemory(), IntGdiRemoveFontMemResource(), IntGdiSetRegionOwner(), IntGetFontFamilyInfo(), IntLoadHookModule(), IntLoadSystenIcons(), IntLockSetForegroundWindow(), IntMapDesktopView(), IntUnmapDesktopView(), IntWinStaOkToClose(), NtUserCallHwndParam(), NtUserCallOneParam(), NtUserDestroyCursor(), NtUserFindExistingCursorIcon(), NtUserGetComboBoxInfo(), NtUserGetListBoxInfo(), NtUserSetSystemCursor(), NtUserSetWindowFNID(), REGION_bAllocRgnAttr(), REGION_vCleanup(), TextIntRealizeFont(), UserDbgAssertThreadInfo(), UserGetDCEx(), UserGetProcessWindowStation(), UserHeapAddressToUser(), UserSetProcessWindowStation(), UserSystemParametersInfo(), and UserUnregisterUserApiHook(). Definition at line 755 of file thread.c. Definition at line 805 of file thread.c. Referenced by AllocateUserMessage(), CaretSystemTimerProc(), co_HOOK_CallHooks(), co_IntCallHookProc(), co_IntCallSentMessageCallback(), co_IntCallWindowProc(), co_IntClientLoadLibrary(), co_IntClientThreadSetup(), co_IntFixCaret(), co_IntGetPeekMessage(), co_IntLoadDefaultCursors(), co_IntLoadSysMenuTemplate(), co_IntPaintWindows(), co_IntPeekMessage(), co_IntProcessKeyboardMessage(), co_IntProcessMouseMessage(), co_IntSendActivateMessages(), co_IntSendMessageTimeoutSingle(), co_IntSendMessageWithCallBack(), co_IntSetActiveWindow(), co_IntSetCaretPos(), co_IntSetForegroundAndFocusWindow(), co_IntWaitMessage(), co_MsqDispatchOneSentMessage(), co_MsqReplyMessage(), co_MsqSendMessage(), co_MsqSendMessageAsync(), co_UserDestroyWindow(), co_UserHideCaret(), co_UserSetCapture(), co_UserSetFocus(), co_UserShowCaret(), co_WinPosSearchChildren(), co_WinPosSetWindowPos(), co_WinPosShowWindow(), DECREASE_THREAD_LOCK_COUNT(), DefWndDoSizeMove(), DefWndStartSizeMove(), DesktopHeapGetUserDelta(), DesktopThreadMain(), GetW32ThreadInfo(), handle_internal_message(), IdlePing(), INCREASE_THREAD_LOCK_COUNT(), IntAddAtom(), IntCallWndProc(), IntCallWndProcRet(), IntCbAllocateMemory(), IntCbFreeMemory(), IntCreateDesktop(), IntDeactivateWindow(), IntDefWindowProc(), IntDeRegisterShellHookWindow(), IntDesktopOkToClose(), IntDispatchMessage(), IntDrawScrollBar(), IntGetAndReferenceClass(), IntGetAtomName(), IntGetCapture(), IntGetCurrentThreadDesktopWindow(), IntGetNextHook(), IntGetQueueStatus(), IntGetThreadDesktopWindow(), IntGetThreadFocusWindow(), IntInitMessagePumpHook(), IntInvalidateWindows(), IntIsClipboardOpenByMe(), IntMsqClearWakeMask(), IntMsqSetWakeMask(), IntNotifyWinEvent(), IntQueryTrackMouseEvent(), IntRegisterShellHookWindow(), IntReleaseCapture(), IntSendDestroyMsg(), IntSendSyncPaint(), IntSetThreadDesktop(), IntSetTimer(), IntTrackMouseEvent(), IntTrackPopupMenuEx(), IntTranslateKbdMessage(), IntUnhookWindowsHook(), IntUninitMessagePumpHook(), IntUserSetActiveWindow(), MENU_DoNextMenu(), MENU_InitTracking(), MENU_TrackMenu(), MsqGetMessageExtraInfo(), MsqSetMessageExtraInfo(), NtUserActivateKeyboardLayout(), NtUserBlockInput(), NtUserCallNoParam(), NtUserCallOneParam(), NtUserCallTwoParam(), NtUserCreateAcceleratorTable(), NtUserCreateCaret(), NtUserGetCaretPos(), NtUserGetKeyboardLayoutName(), NtUserGetKeyboardState(), NtUserGetKeyNameText(), NtUserGetThreadState(), NtUserLoadKeyboardLayoutEx(), NtUserLockWorkStation(), NtUserMapVirtualKeyEx(), NtUserSendInput(), NtUserSetKeyboardState(), NtUserSetThreadState(), NtUserSetWindowsHookEx(), NtUserSetWinEventHook(), NtUserToUnicodeEx(), NtUserValidateTimerCallback(), NtUserVkKeyScanEx(), NtUserWaitForInputIdle(), PostTimerMessages(), UserDbgAssertThreadInfo(), UserDerefObjectCo(), UserDestroyMenu(), UserEnterExclusive(), UserGetActiveWindow(), UserGetCPD(), UserGetKeyboardLayout(), UserGetKeyState(), UserGhostThreadEntry(), UserInitialize(), UserOpenClipboard(), UserOpenInputDesktop(), UserRefObjectCo(), UserRegisterHotKey(), UserRegisterUserApiHook(), UserSendKeyboardInput(), UserSendMouseInput(), UserSetActiveWindow(), UserSetCursor(), UserShowCursor(), and UserUnregisterUserApiHook(). Definition at line 1257 of file process.c. Referenced by AllocW32Process(), and ExitProcessCallback(). Referenced by RtlAdjustPrivilege(), and RtlpOpenThreadToken(). Referenced by lie_about_fs_type(), RtlCreateUserProcess(), RtlEncodePointer(), and RtlSetProcessIsCritical(). 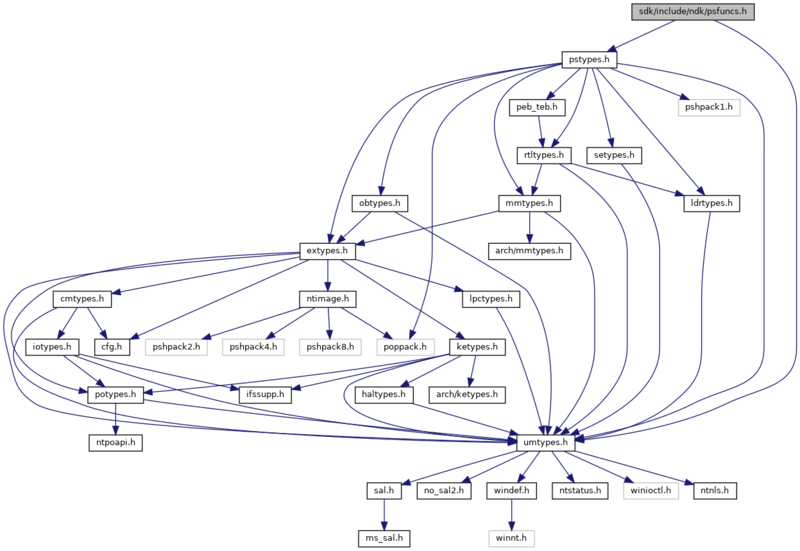 Referenced by LdrpInitializeProcess(), and RtlSetProcessIsCritical(). Definition at line 715 of file psfuncs.h. Definition at line 861 of file psfuncs.h. Referenced by BaseExitThreadPoolThread(), CsrDereferenceNtSession(), DbgkExitProcess(), DbgkExitThread(), NtTerminateJobObject(), NtTerminateProcess(), NtTerminateThread(), PspExitThread(), PspTerminateProcess(), PspTerminateThreadByPointer(), PsTerminateProcess(), PsTerminateSystemThread(), RtlpExitThread(), and test_query_process_basic(). Definition at line 834 of file psfuncs.h. Referenced by NtQueryInformationThread(), NtSetInformationThread(), NtUserQueryInformationThread(), and NtUserSetInformationThread(). Definition at line 837 of file psfuncs.h. Referenced by NtQueryInformationThread(), NtSetInformationThread(), NtUserSetInformationThread(), and PspQueryDescriptorThread(). Referenced by AdjustTokenGroups(), AdjustTokenPrivileges(), BasepReplaceProcessThreadTokens(), CreateProcessInternalW(), GetSiteSidFromToken(), GetTokenInformation(), IsTokenRestricted(), LogonUserExW(), LsapLogonUser(), LsarSetSecurityObject(), MyLogonUser(), NtAccessCheck(), NtAdjustPrivilegesToken(), NtCreateToken(), NtOpenProcessToken(), NtOpenProcessTokenEx(), NtOpenThreadToken(), NtOpenThreadTokenEx(), NtQueryInformationToken(), NtSetInformationProcess(), NtSetInformationThread(), NtSetInformationToken(), OpenProcessToken(), OpenThreadToken(), PsAssignImpersonationToken(), PspSetPrimaryToken(), RtlAdjustPrivilege(), RtlCreateUserSecurityObject(), RtlDefaultNpAcl(), RtlFormatCurrentUserKeyPath(), RtlpGetImpersonationToken(), RtlpOpenThreadToken(), SamrSetSecurityObject(), SepCreateToken(), SetThreadToken(), SetTokenInformation(), SHTestTokenMembership(), and START_TEST().